Mitsubishi has announced pricing and trim levels for the 2014 Outlander, including two powertrain configurations with the base model starting at only $22,995 and with price reductions across the board. When Mitsubishi previewed the all-new 2014 Outlander, the rumor was that they would be doing something spectacular to improve sales and gain market share. Now, with pricing for the 2014 model announced, it appears that part of that will be MSRP reductions on nearly every trim level from comparable trims in 2013. Improved fuel efficiency, safety, and connective technologies will bring the 2014 Outlander to next-generation status. 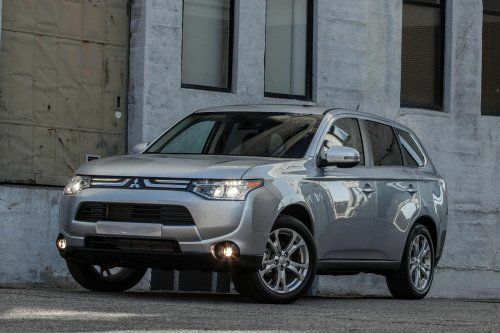 All-new from the ground up, the 2014 Mitsubishi Outlander expects to be one of the most fuel-efficient compact utility vehicles (CUV) on the market, even with 7-passenger seating (5+2). EPA ratings have not been complete, but Mitsubishi is expecting 31 mpg highway for the 2014 Outlander in its ES and SE FWD model configurations. Two engines are being offered along with two types of transmission. Models in the ES and SE trims will have a 2.4-liter 4-cylinder engine using Mitsu's new MIVEC system. This will couple to a continuously variable transmission (CVT) to maximize efficiency, including a new ECO-mode as standard. The base model ES trim comes only in 2WD and starts at $22,995 plus destination. SE trim levels in 2WD begin at $23,795 and increase to $26,595 and $29,895 in the Premium and Touring packages respectively. Destination not included. SE trim adds 18-inch alloy wheels, a 6.1-inch touch panel display on the console, heated front seats, dual-zone climate control, the FUSE Handsfree Link System and more depending on Premium or Touring choice. Mitsubishi's Super All-Wheel Control (S-AWC) brings all-wheel-drive to the 2014 Outlander. This is available as an addition to SE trim levels starting at $25,795 for the base SE, $28,595 for the SE Premium trim and $31,895 for the SE Touring trim. Delivery not included. To get into a six-cylinder engine, Mitsubishi buyers will have to opt for a 2014 Outlander GT model, which upgrades to a 3.0-liter V6 with a 6-speed automatic transmission and steering-mounted paddle shifters as standard. This configuration is available only with S-AWC. The base level GT has the same trim options as the base SE and starts at $27,795 while the Premium and Touring packages are $30,595 and $33,895 respectively - plus destination. Prices for the new 2014 Mitsubishi Outlander are below comparable 2013 model trims by up to $800.